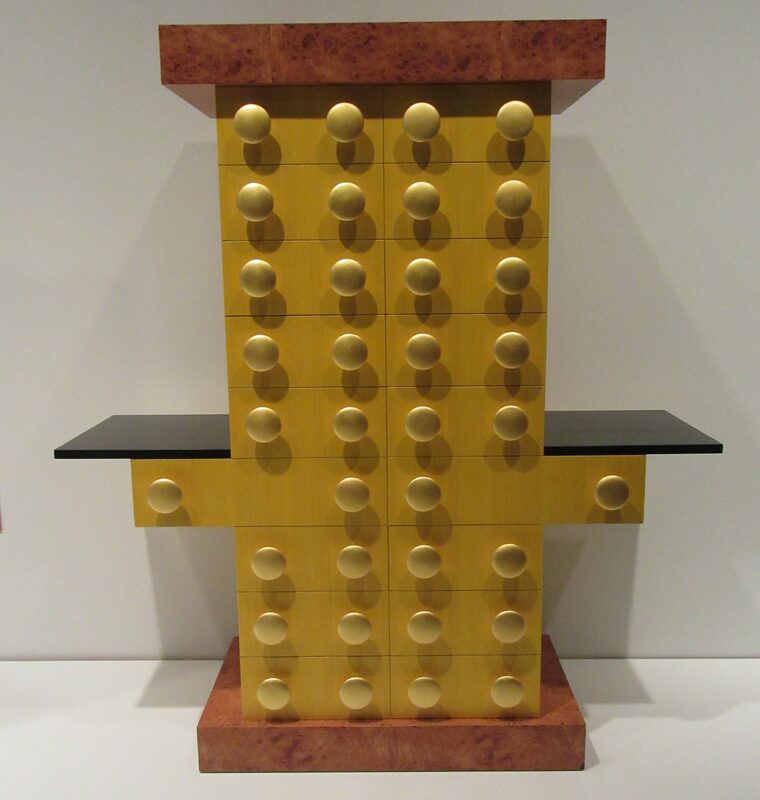 Cross-shaped and studded with golden dots, Ettore Sottsass’ Yellow Furniture reads as an homage to Otto Wagner’s Steinhof Church, which is also cruciform in plan and features golden dots as the leitmotif. 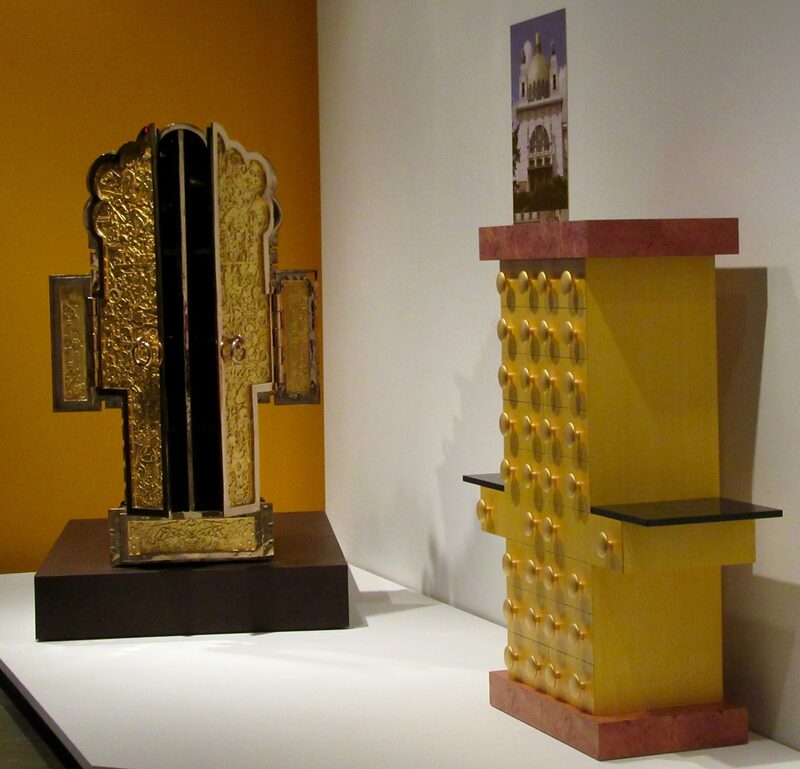 Both Yellow Furniture and the Steinhof Church transfer religious concepts into material form, specifically the spiritual association in Christian iconography of gold as a material and symbol of the heavens. 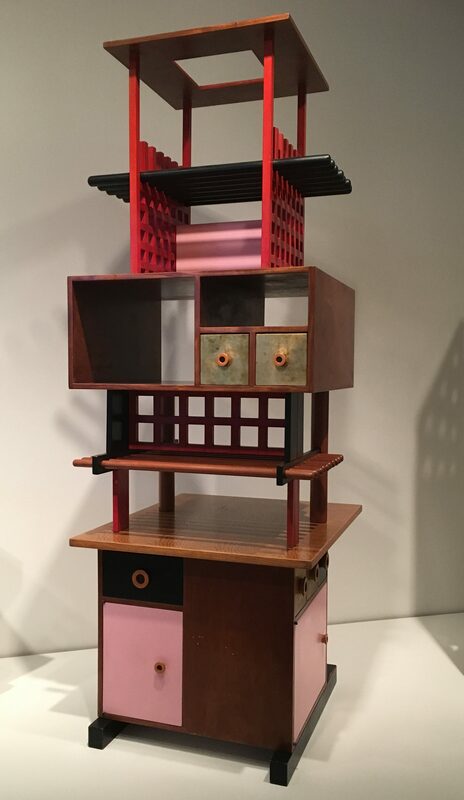 Consistent with Christian ideals, Sottsass intended this piece for production by Indian craftsman as a way of addressing the poverty he witnessed during his travels. 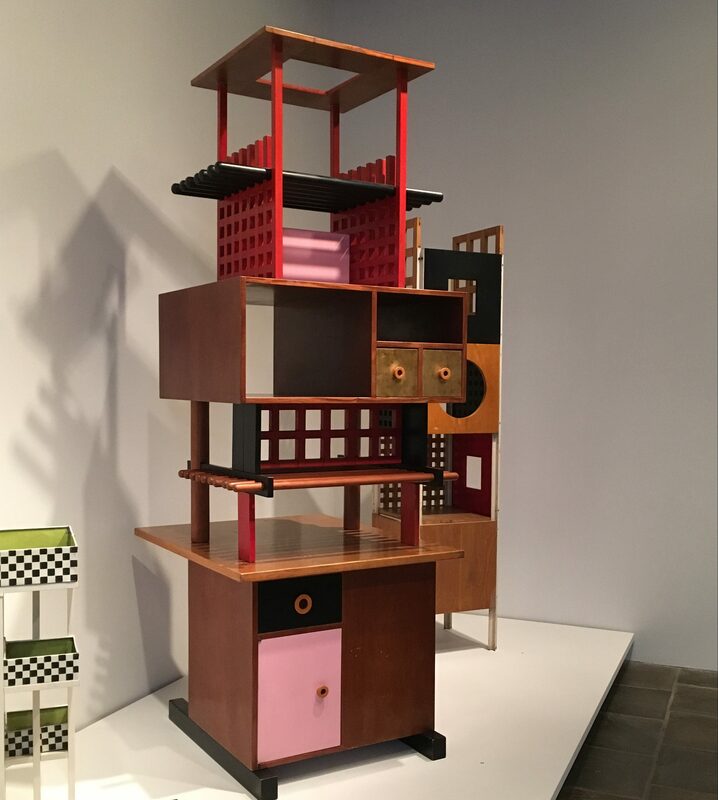 Photographed in the Met Breuer in NYC. 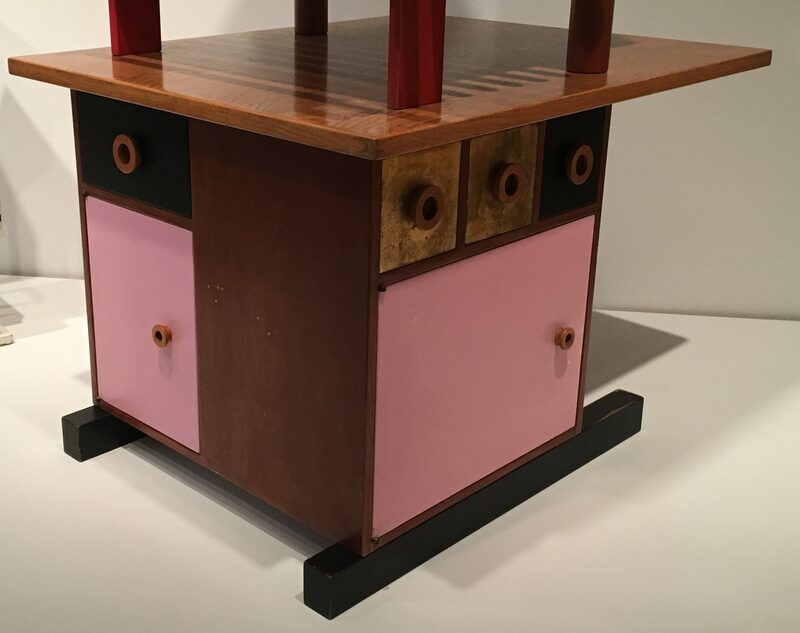 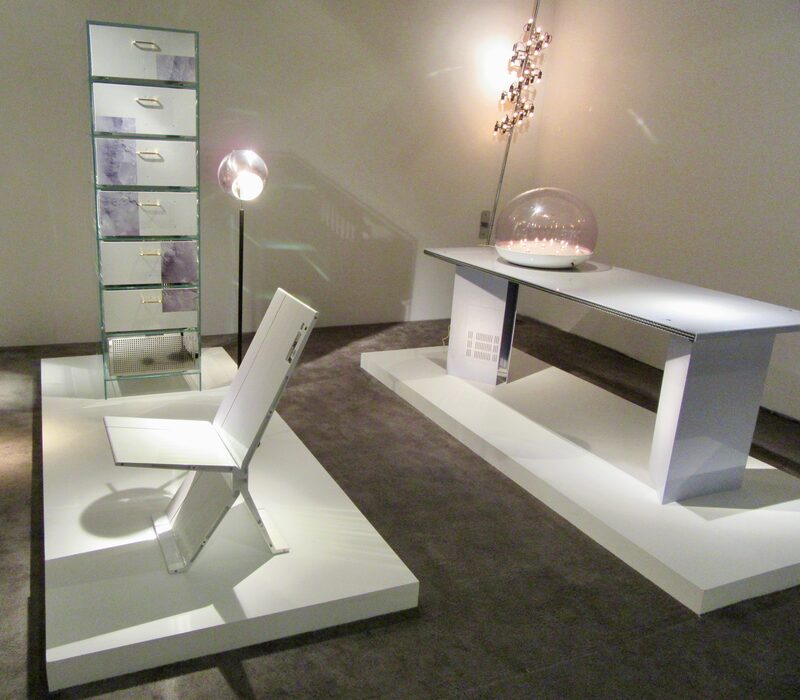 as part of the Exhibit, Ettore Sottsass: Design Radical. 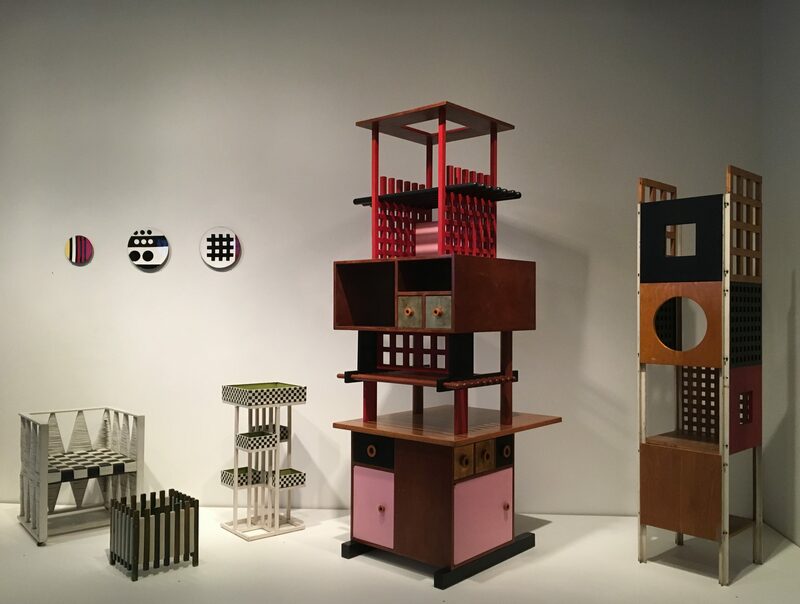 Ettore Sottsass (1917 – 2007) designed the interiors of Mario Tchou’s Milan apartment and named the project for Tchou’s daughter, who captured his heart as she attempted to scale the Tower. 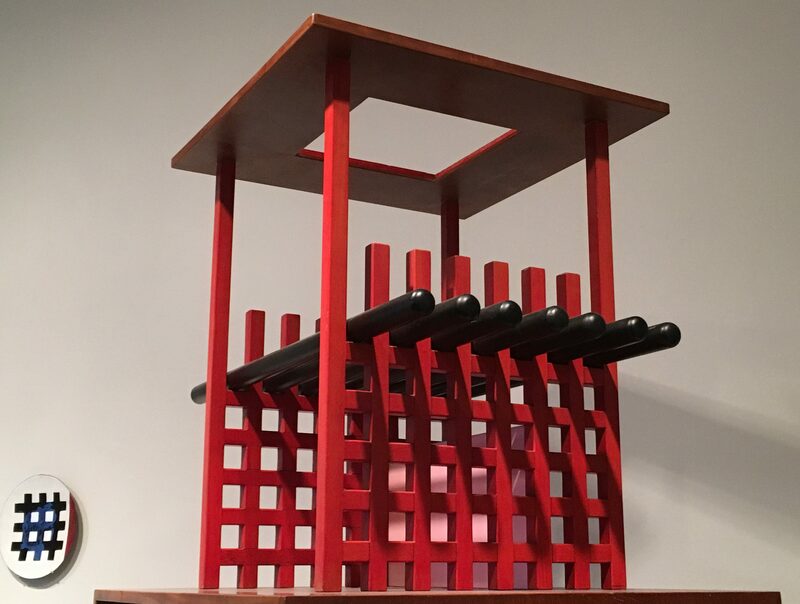 The latticework, dowels and cubic proportions suggest the influence of the Arts and Crafts movement, the Wiener Werkstatte, and the Bauhaus. 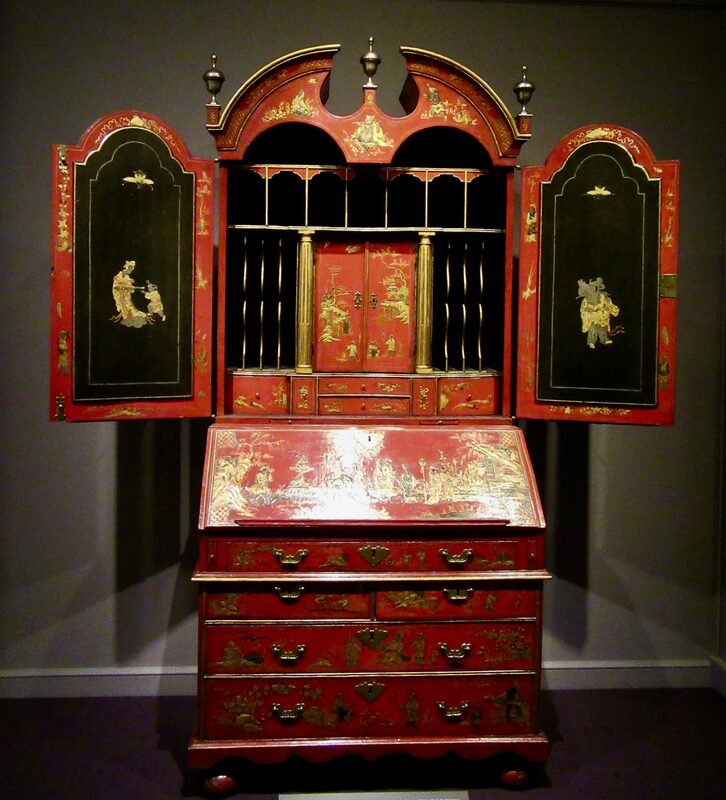 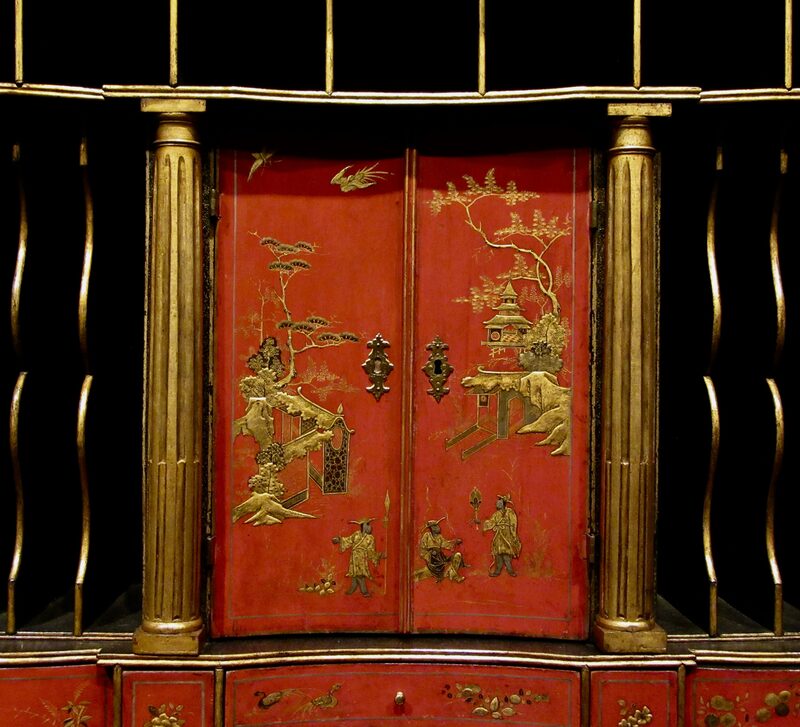 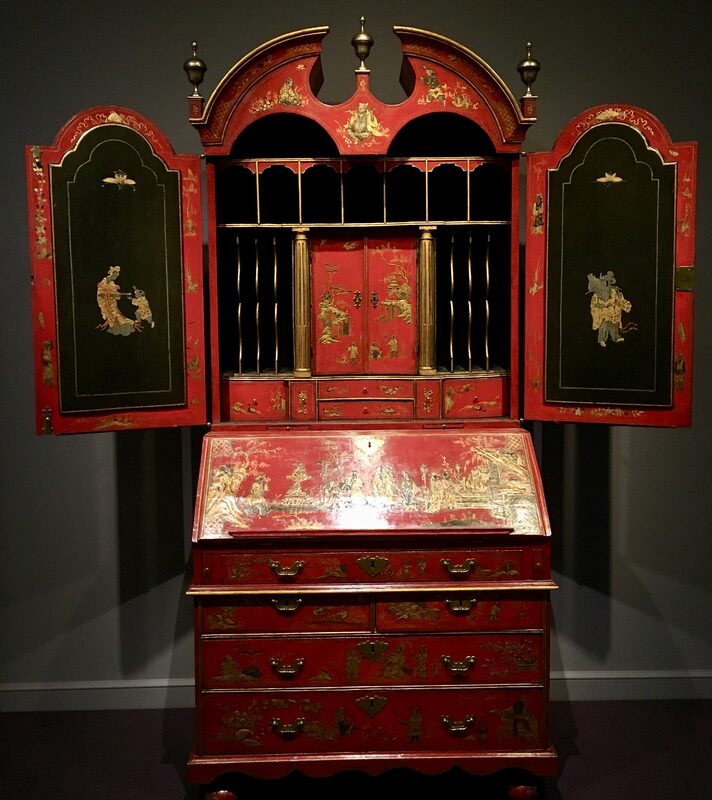 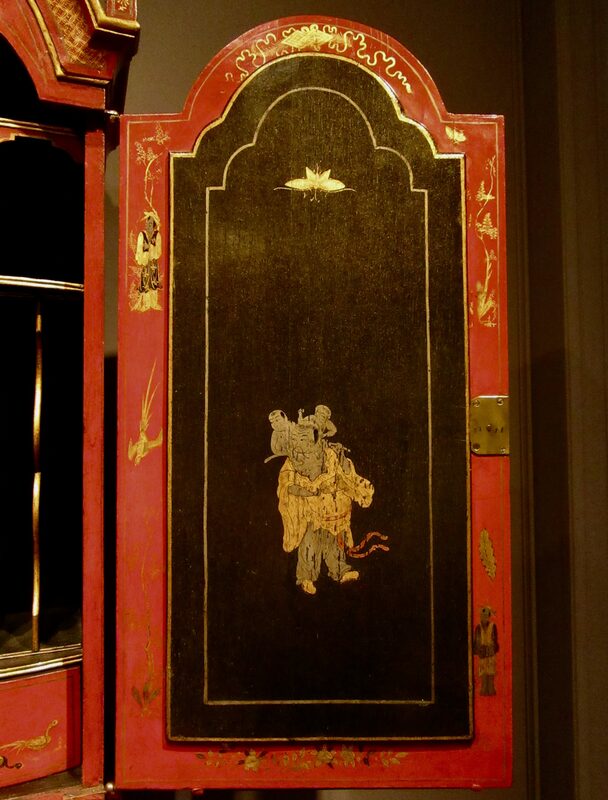 These interests merge with eastern touches — the Chinese red and black lacquer, gold leaf and pagoda construction — into a hybrid table/desk/shelf/cabinet/chest of drawers, a catch-all for the needs of daily life. 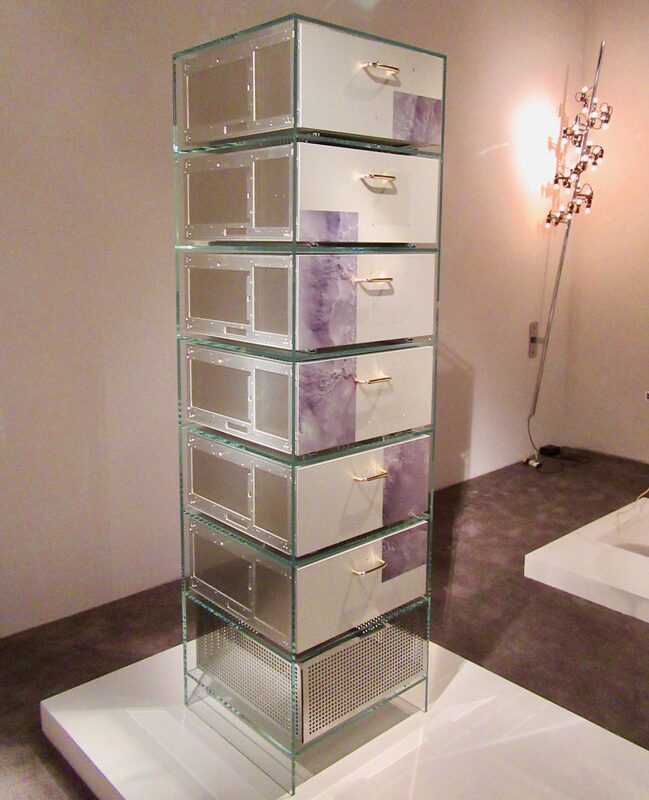 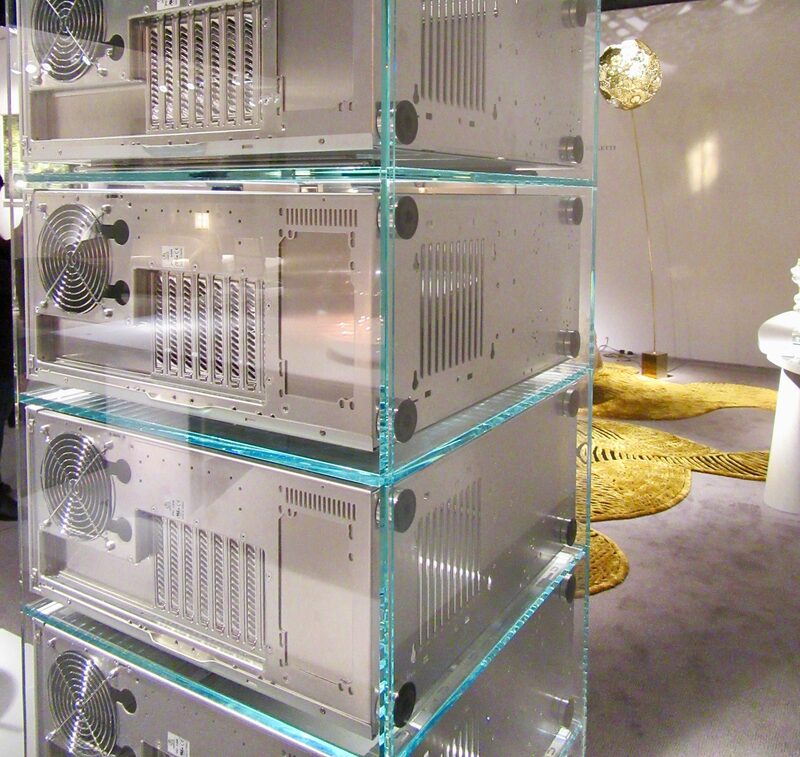 The Tower, in short, is a kind of perception machine for the interior of the home. 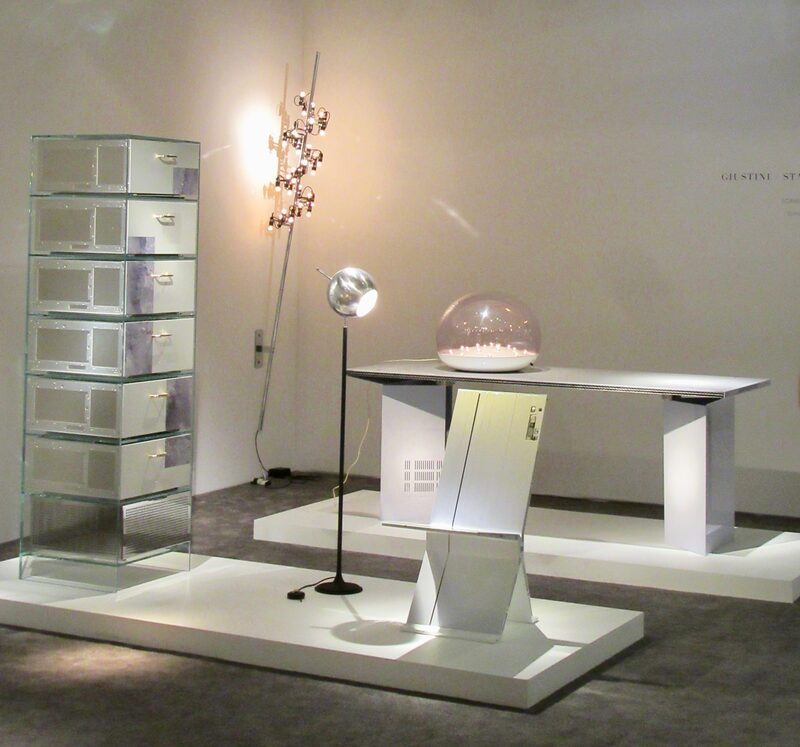 Finnish desirer Tuomas Markunpoika explores memory and metaphysics in the design of all his objects. 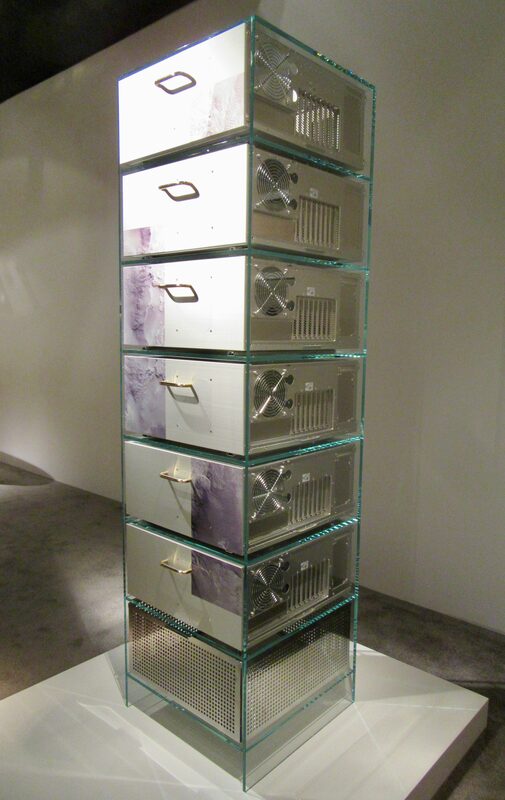 In honor of his grandmother, who suffered from Alzheimer’s disease, Markunpoika created Engineering Temporality (2012) by welding hand-cut rings of tubular steel over a traditional wooden cabinet. 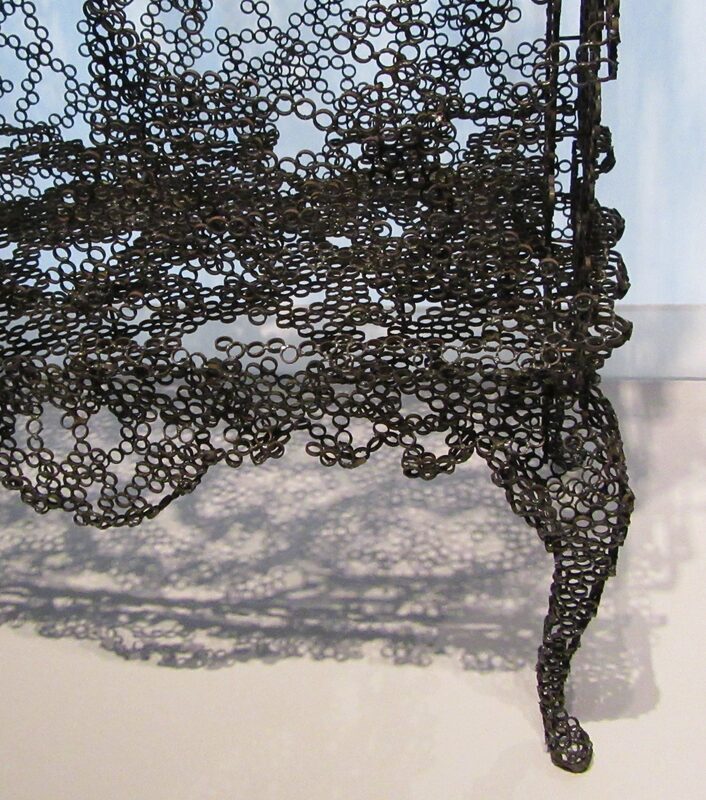 He then burned away the cabinet, leaving behind a shell of blackened metal rings; a ghost or shadow or the original form. 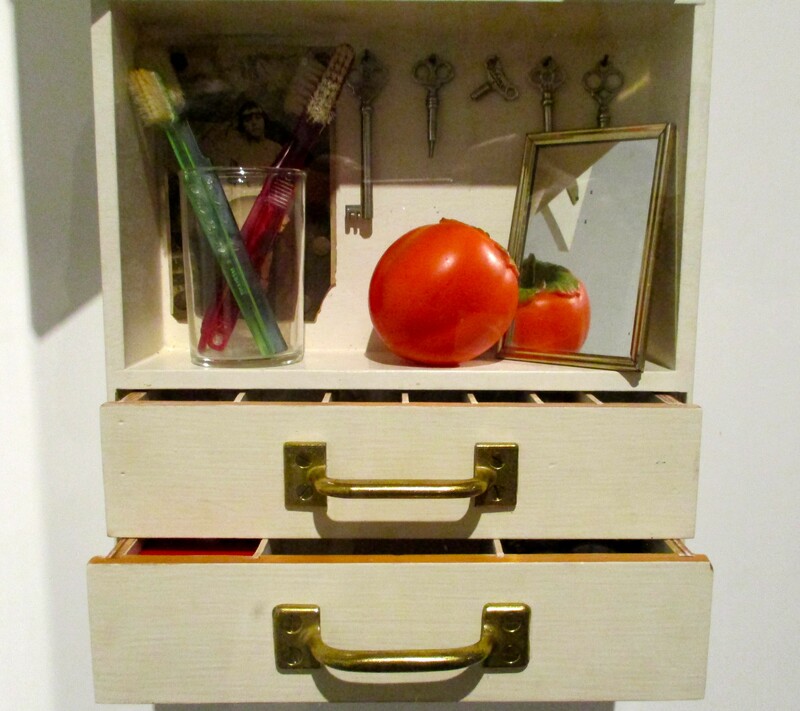 The objects in this cabinet beg to be activated and handled. 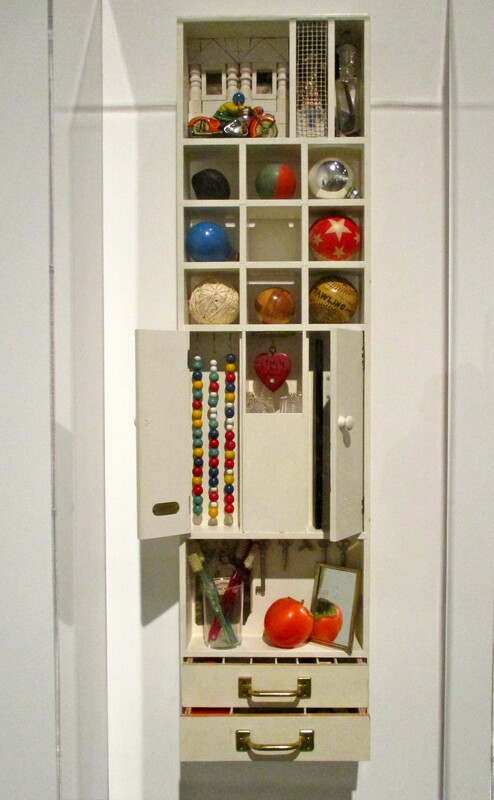 A key member of the Fluxus movement, George Brecht (1926 – 2008) choreographed events; more specifically, he turned objects into events by inviting the visitor’s engagement. 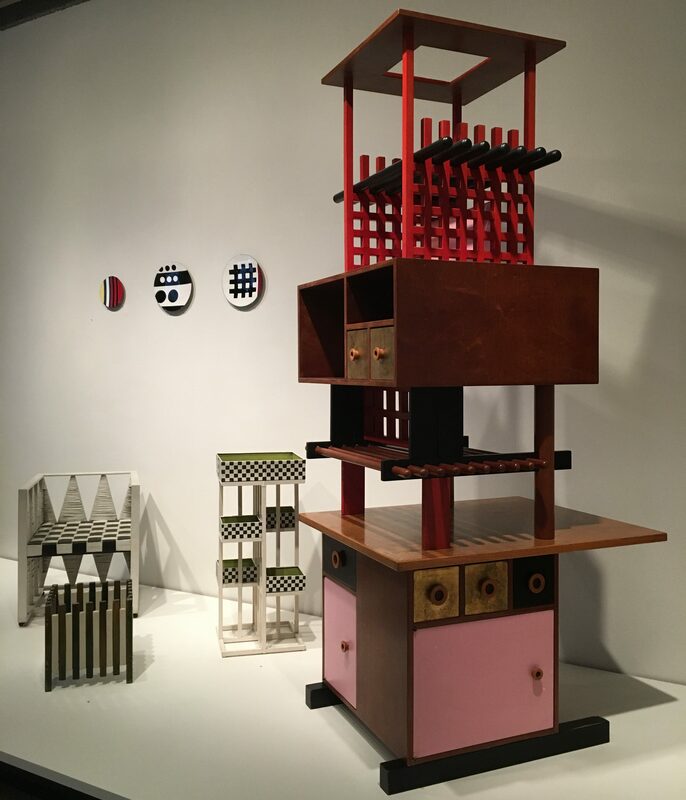 Repository’s power relies on the strong stimulative nature of the items, and it could never be truly finished because the viewer and the event were always changing. 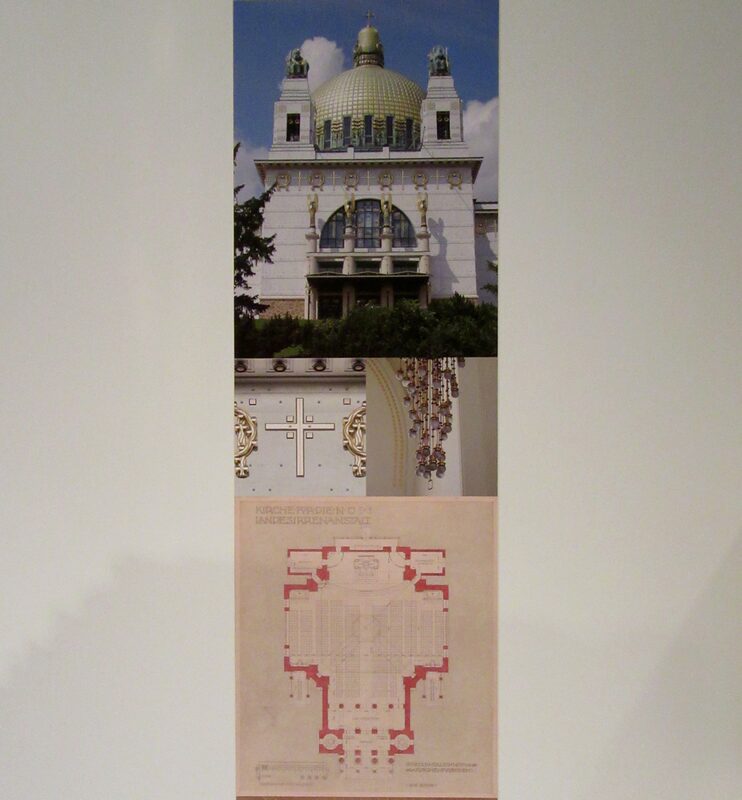 Now that the work has entered an institutional context, however, the need to preserve it overrides the call to participation. 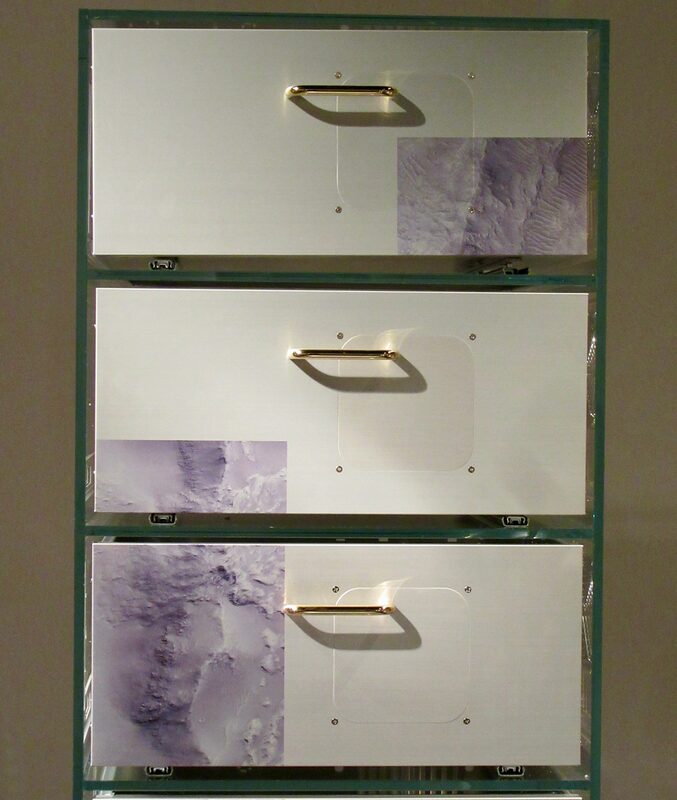 Thus, the concept of discovery is forestalled by museum practice, leaving the eventfulness of Repository unfulfilled. 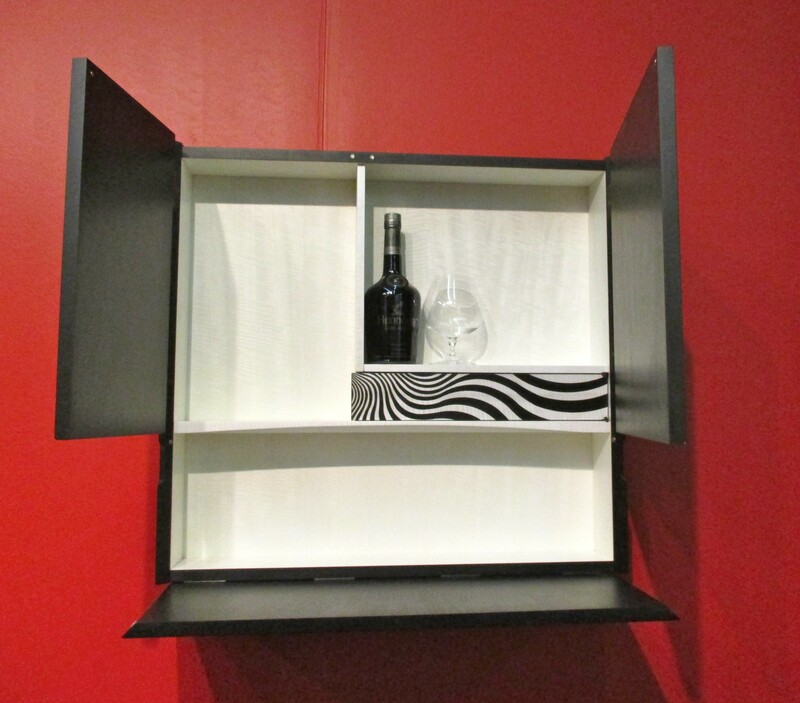 Repository was Photographed in The Met Breuer (former home of The Whitney Museum), in Manhattan, where it is part of the Museum’s Inaugural Exhibit, Unfinished: Thoughts Left Visible. 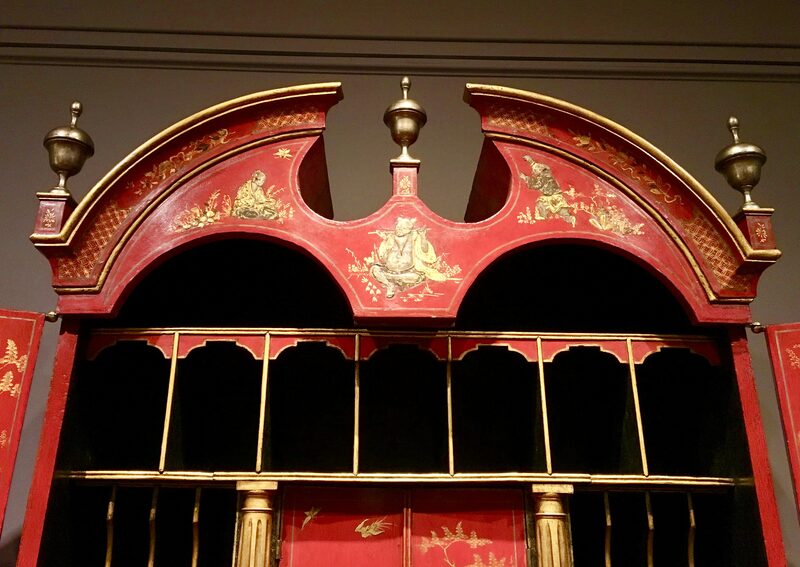 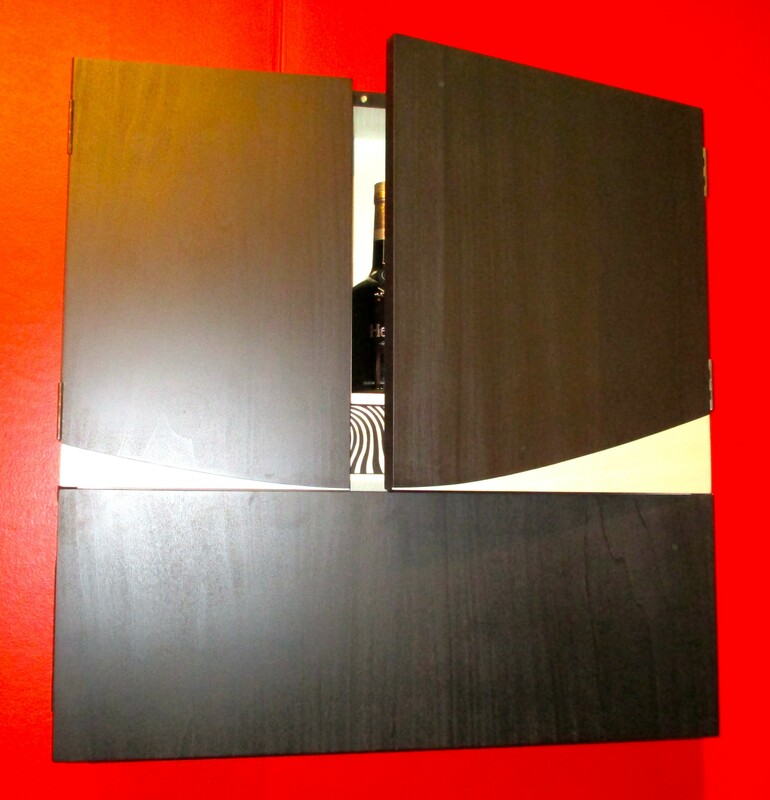 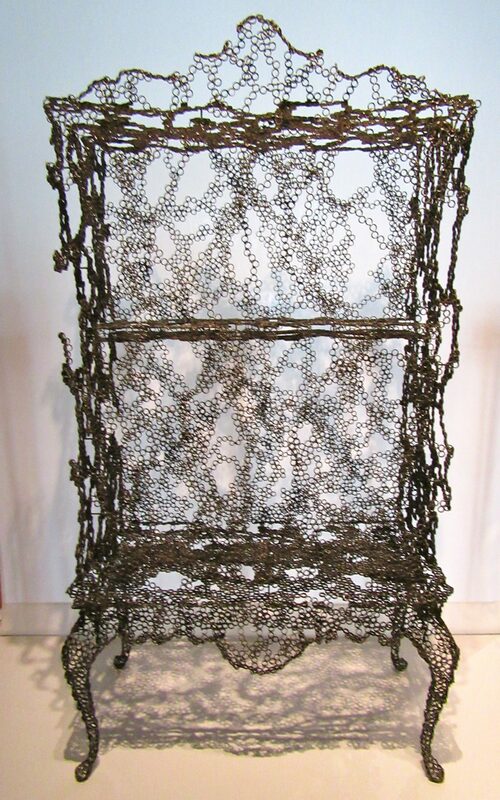 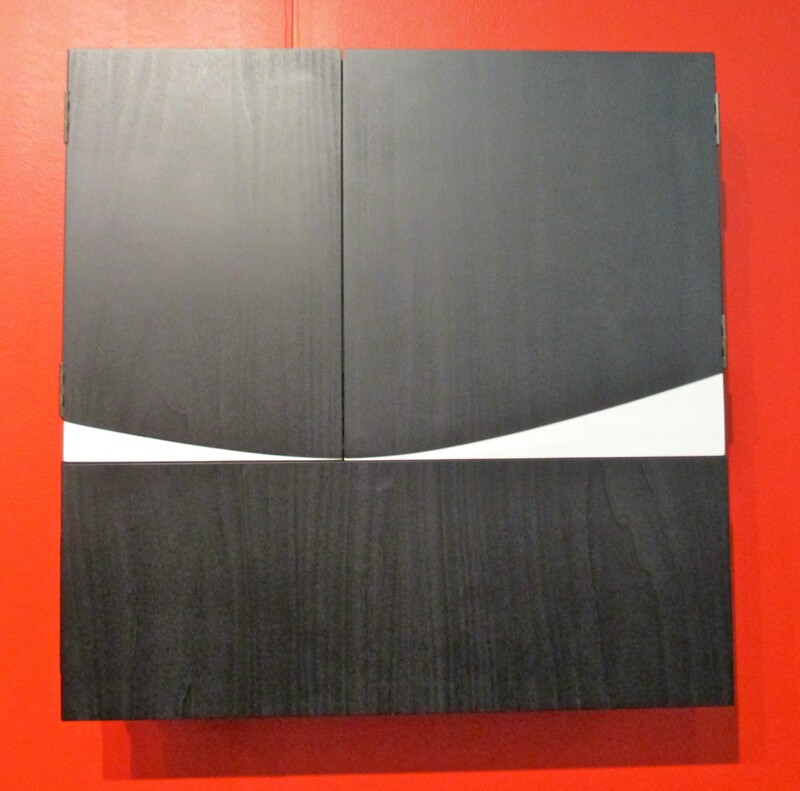 The piece is part of the permanent collection of the Museum of Modern Art, also in New York City.